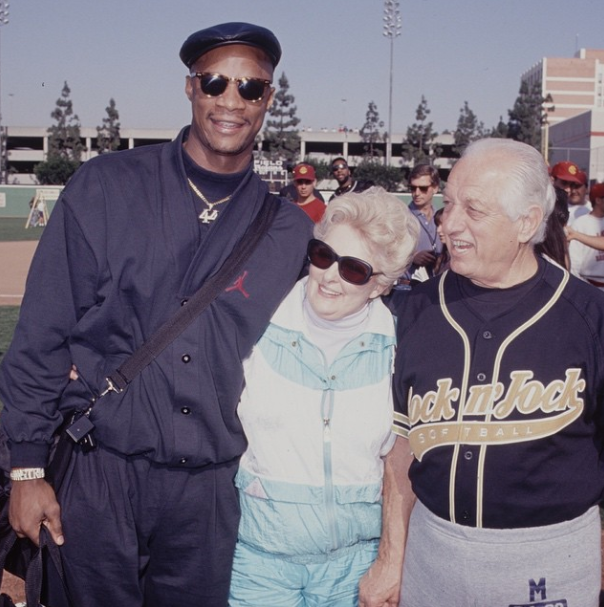 What a fantastic photo pf Tommy Lasorda, his wife Jo and slugger Darryl Strawberry at a (what I believe is) MTV's "Rock 'N Jock" softball event in January of 1990. Photo provided via Lasorda on his instagram. Nice find! Via Orel at Sons of Steve Garvey, "3,311" Found at the corner of Sunset and Elysian Park - at the main entrance for Dodger Stadium. Via Mike Petriello at FanGraphs, "Hyun-Jin Ryu: Quietly Awesome." via Ron Cervenka at Think Blue LA, "Dodgers Winter Development Camp about to get under way – unofficially." Via Jon Weisman at Dodger Insider, "Minor-league catcher Pratt Maynard retires." Dodger pitcher Brandon McCarthy pens an article for The Players' Tribune, "Hall of Denial." The question of whether performance enhancing drug (PED) users should be allowed to gain admittance to the Hall of Fame is one that I’ve thought a lot about. Admittedly, it’s a mess. The ramifications extend far and wide, but I believe the answer is to admit those players whose on-field accomplishments merit it and leave history to be the final judge and jury. Ultimately, I believe the greatest injustice would be to leave worthy players—some of whom are objectively among the greatest ever—out of the Hall of Fame, when there very well may be guys already enshrined who have used performance enhancing drugs. Via Jeff Sullivan at Just a Bit Outside, "The Most Quietly-Excellent Aspect of the Quietly Excellent Howie Kendrick." So Kendrick didn't pop-up once over a full season. Now, he wasn't the only one. Last year, Shin-Soo Choo didn't register a pop-up. Neither did Joe Mauer. Christian Yelich only popped up on the very last day of the season. But, Kendrick batted a lot more often than Choo or Mauer did. And, this isn't just a 2014 phenomenon. It's not just that Kendrick didn't pop up -- it's that Kendrick has always only very seldom popped up. And that's an indicator of the very thing that makes him successful at the plate. Via Jon Weisman at Dodger Insider, "Garrett Gould, Ross Stripling on road back from Tommy John surgery." “I just passed nine months, so I’m in the stage where I’m about to really start ramping everything up,” Stripling said Friday. “I took the holidays off — I was in Arizona right before Christmas, and that’s when I started flipping a couple of curveballs and changeups for the first time. Everything went great with that. Via Scott Andes at Lasorda's Lair, "Longtime Dodger Scott Elbert Signs With The Padres."